WARNING: All the images are from Pokécrystal, not Pokegold. There is the anger count and the eating status, in red appear a bit different but however is present, also the texts are present. 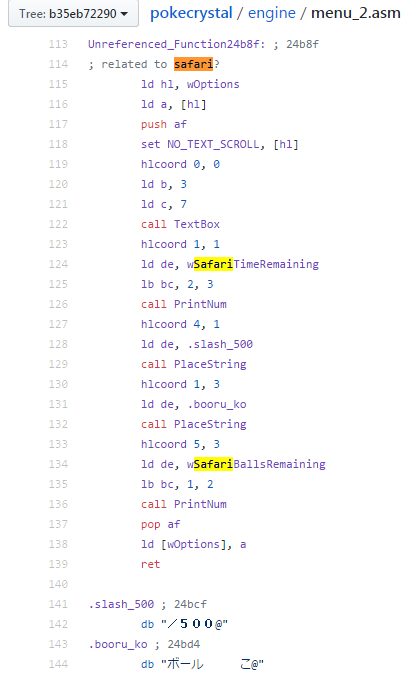 According to the disassembly, there is a safari zone flag, the setbit2 0x12. Seems that the rock and the bait aren't present, in Red I found references to animations as example, not in Pokécrystal but will not be a problem, animations aren't the most important thing. 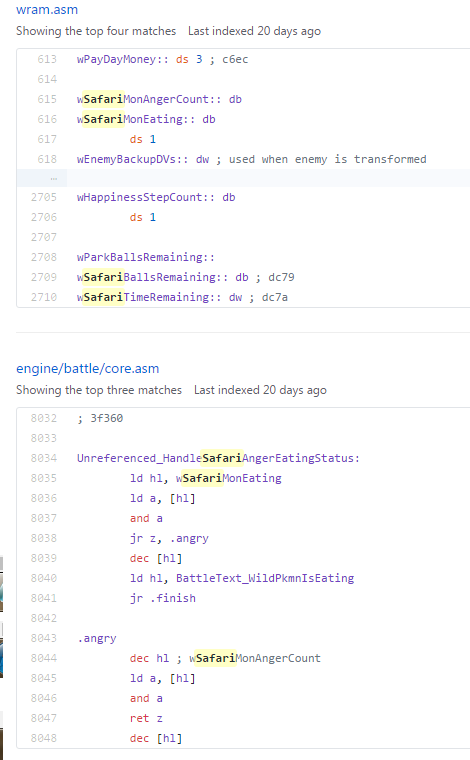 In the items constants seems references to the SAFARI BALL, but is the MOONSTONE now, however the Safari battle type could use the PARK BALL instead, should have the same effect. You can compare safari and contest menu data structures. 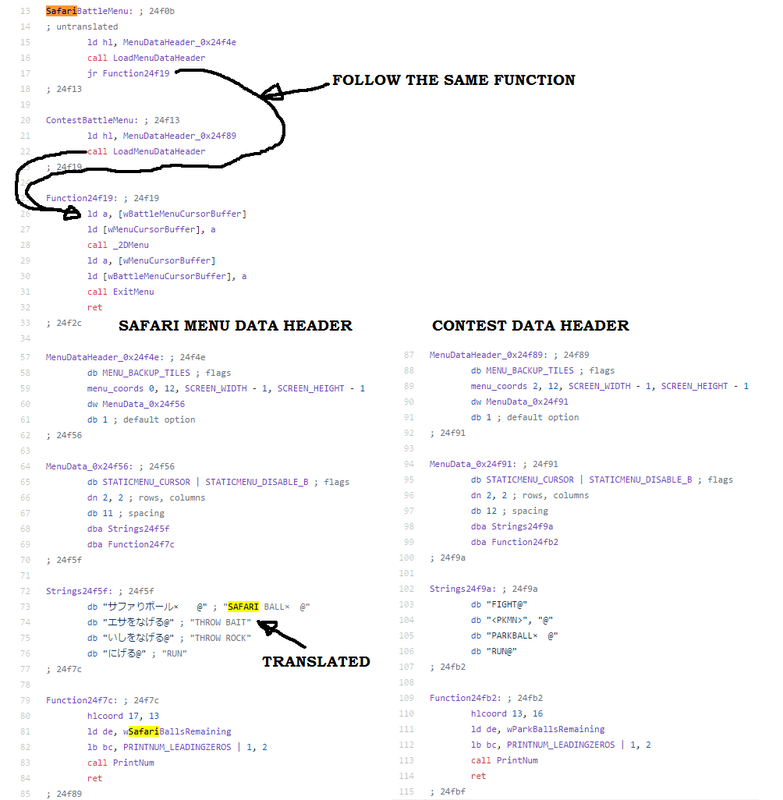 I translated the safari menu and tried to modify the contestbattlemenu to go to 24F4E instead of 24F89. When the contest battle type starts I see the Safari menu with the translated voices but my first pokémon go to battle and if I try to use the ball I see that remind me to the fight menu and instead the ROCK voice throw a PARK BALL. Why this? Maybe 'Cause both the battle types follow the same function or is something else? Some important Safari-related code does not exist and would have to be reimplemented. Mateo did so here for Polished Crystal, so you may want to study her changes and apply them to your copy of pokecrystal (as opposed to Polished Crystal, which has lots of its own changes, so you can't just copy+paste that code). Then the tutorial get replaced with the Safari game? Mateo's changes overwriting the tutorial battle type? I'm studying the code, I see that could I have problems with 3 files, 'cause you know that my project is for Gold/Silver/Crystal in english but also italian, then if I have patience I could do it in a month (maybe) fixing all the pointers that change adding stuff between the existing codes and using also the ASM editor for the roms. Then the question is: If I change the core and the other necessary files, there is something else in the game that refer to them? Can I repoint these files in the rom? There is a pointer that point to them? And maybe a better question, there is a way to set a specific offset where assembly a file? If I know as example that I have an entire free bank in the rom can I point as example to assembly here the main.asm file? Will be easier then copy all to a rom in another language the changed files. I can't restart all the project from the beginning (it's over except the SAFARI ZONE) and I can't translate all the game... But if I could assembly these changed files where I want maybe I could copy them and repoint the rom to the new added and maybe only translate their text strings. Is possible? No, my changes did not replace the tutorial battle type. Oh, ok, was a doubt. And how you can set the safari game started? Only setting the bit 0x12? However is possible set a specific pointer during the assembly of the hacked files? If yes will be easier copy the changes to a rom in another language. I did it partially, changing all trough GBasmeditor, without adding the bait function 'cause I don't have enough space at the end of the bank to repoint also other existing routines to use with the added, but is a bit buggy, I don't know why but don't show the texts like that I throw the rock, and don't tell nothing about that is angry, only if I throw a lot of rocks the pokémon runs, but don't tell nothing, only the run text works. Maybe don't load the texts 'cause for now I hacked only the core.asm file and maybe is trough the battle menu texts that load the bank to the other effects texts? ; Auto input: choose "ITEM"
Hello Mateo and Rangi. Have you discovered something else about safari battletype? I added the bait function, I have only 1 little bug with my copy to an italian rom via hex editing, the balls don't decrease, but isn't rilevant now. Now I want only to have a way to switch to the battle type that I added for both grass and fishing, currently I can test it only with a gameshark code. Can you tell me something about please? If a temporary flag is necessary I have one recicled that is only composed by only one value.